I wanted one of these prints about 10 years or so ago when I went to Middle Tennessee State University. I loved antique stores even then. When we went back to TN during our vacation, we toured Oaklands Mansion - where they're doing an ongoing exhibit for the month of October on mourning customs. At the end of the exhibit, I saw another example of this print which reminded me how much I wanted one. Basically, during the 1900's, when a loved one passed away, a type of "funeral announcement" or notice would be printed - on a black paper with gold lettering - there were all sorts of customs associated with these mementos; all the way down to details like the thicker the border on the document, the longer the person had lived (or the more important they were in society). 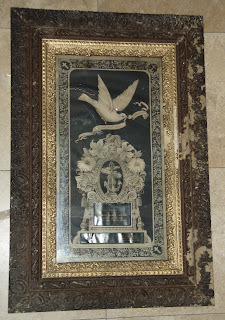 Anyway, that announcement would be put into a frame behind the larger "mat" which is the beautiful piece above - the gorgeous dove, with its banner "Gone but Not Forgotten" - and down below, you can see the name of the boy who passed away (at age 17). In the bottom opening is a poem dedicated to him. long story short: it arrived with the glass broken. Because of its age and the way it was kept, the document (paper) stuck to the glass. some of it had ripped off, but most was just sitting there, stuck to the glass. I brought it to a conservation framer yesterday afternoon, and they didn't have any grand (inexpensive) options for me - it could be restored, but it'd be a great expense. Since the frame is already really messed up (which I like, actually) I can't justify spending the money in preserving it further. I took it home and followed the conservationist's advice - lay the piece flat, and slowly try to use a blade to cut the ink from the glass... slowly. there is still about a 4" diameter part of the piece stuck to the glass (I stopped after that last rip) and I'll still try to get it off of the glass - I was able to save the part I ripped off the document - and I think I can put it back with it not looking that bad - since it's so old and faded and warped, etc. I believe it'll just add to the "old" look of it. when shipping pieces fragile like this in vintage frames: take the piece OUT of the frame - have it wrapped in acid free foam core and well taped so it's safe and secure - then ship the pieces together - and insure them for a LOT - so if this happens again it can be restored. Ouch. Oh, I feel bad reading this. We have some antiques and I know how fragile they can be. I hope your repair works out OK and you can fix things so it's not too noticeable. I had some art glass shipped from Vancouver to Saskatoon after my uncle passed away 10 years ago, and it arrived broken. I was sad, but pleased that my dad had thrown in a cross stitch sampler from 1833 (no-one we know; my uncle frequented estate sales). I had it reframed locally, and it is one of my favourite things. I'll send you a picture sometime. I think the world needs more people like you who take on this type of stewardship. I'm sure the boy who passed away would be pleased that someone cared this long after he was gone.